Absolutely a beautiful and extraordinary ornamental shrub to add interest and contrast to any garden. And, in the darkness of the night, its stunning white pagoda-shaped flower clusters will sparkle and light up the garden! How lovely! Growing in our garden is the fabulous white variety, Orthosiphon stamineus ‘White’. We love that it grows easily and fast, though a little too hastily, wild and free! Wonderful that it is fuss-free and blooms readily not only when groomed with frequent haircuts but almost year round in our tropical warm climate. Plant type: Tropical herbaceous perennial, native to China, Taiwan, South East Asia and tropical Australia. Features: Orthosiphon aristatus is a fast-growing herbaceous shrub that can reach 1-2 meters tall and spread to a meter wide. It is erect and highly branched with a tendency to touch ground and root easily. Semi-deciduous foliage is medium green in color and borne in opposite pairs on a reddish-brown quadrangle stem that is slightly puberulent. Glossy leaves are glabrous to puberulent on both surfaces and lanceolate-shaped with coarsely serrated margins. 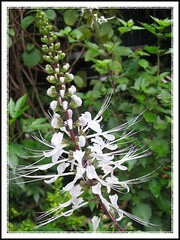 It produces racemes that are 10-20 cm long with pretty tubular flowers that are uniquely shaped and bear 5-6 cm long stamens that look like cat’s whiskers, hence the common name. 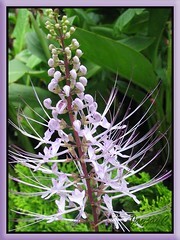 These beautiful pagoda-shaped flower clusters can be white/almost white, or mauve to lavender or light violet/purple. Culture (Care): Cat’s Whiskers is easily grown with minimal maintenance. Light: Full sun to part sun or partial shade. Grows best in sunny location. It can tolerate shade but tends to grow skyward with less flowering. Moisture: Medium to high water requirements though less once established. Soil: Adaptable to various soil conditions, but preferably compost-enriched potting mix, that is consistently moist but well-drained. Others: It takes well to heavy pruning, so prune regularly to maintain a bushy appearance and to encourage prolific flowering. Deadhead spent blooms. Feed with a liquid fertilizer monthly. No serious pest or diseases. However, do check for whiteflies, mealy bugs or scales that can infest it. For temperate zones: Hardiness: USDA Zone 9a-11. Read more at Dave’sGarden. Though considered a tender perennial or annual, it bounces back strongly after a good freeze! Propagation: From seeds though best propagated from softwood cuttings that root easily in water or ground. Best done when deadheading spent blooms or pruning. Just take 5-6 -inch stem cuttings and cut off their lower leaves, then poke them into moist soil, water regularly and in a short time you will see new leaf growth. Also, branches that touch the ground root easily, so you can snip them, remove and propagate elsewhere. Usage: Orthosiphon aristatus will be excellent for perennial borders or informal hedges as it tolerates hard pruning. Well suited for containers or planters. 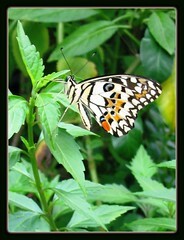 Grow as an attractive ornamental garden specimen to attract bees, butterflies and humming birds. It is also popularly used as a traditional herb, especially in Malaysia and Indonesia to treat diabetes, kidney stones and urinary disorders, high blood pressure, rheumatism and gout. Dried leaves can be brewed as a herbal tea or a tasty drink with honey or milk. There are products of O. aristatus (Misai Kuching or Misai Kucing) extracts sold commercially as organic herbal tea for these medicinal purposes. More at wikipedia and Pure Herb, the traditional way to good health. Yucca aloifolia (Spanish Bayonet) – excellent for landscape design! I have been drinking OA for about 10 months. when my OA plants grew big i pick about 30 to 45 shoots mix it with my 3 in one coffee everyday. now i’m worried of the side effects. Hi I loved your post. I feel that it is important when discussing diabetes to at least refer to natural treatments that have been shown to be effective in managing high blood sugar. Various natural herbs can be including in a diabetics routine that may help maintain a healthy glucose level. This is a really fast growing plant. If you’re into urine fertilization, this plant can take it all. I give my plants heavy doses and are still thriving. Among all my herbs, this one is the true survivor. It thrives in almost any kind of condition (except dry). Thanks for sharing your experiences about this plant, Chris! Thanks for your lovely blog. It is indeed informative and I managed to find the plant I was looking for and more. 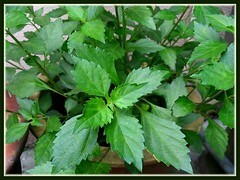 As for misai kucing, it is a very useful herb to plant even in a pot. As you rightly mentioned, it grows well in full sun. It is also useful when steeped as a tea to get rid of urinary tract infection. I usually pluck the fresh leaves and steep in hot water for a delightful brew. We appreciate your kind words and sharing, Maya! Nice to know that you had found our site useful. And, thanks to you that I got to revisit this article and be reminded that Misai Kucing is also good for gout that is currently causing much pain for John, my better half. may i know the exact flowering season of orthosiphon stamineus plant.